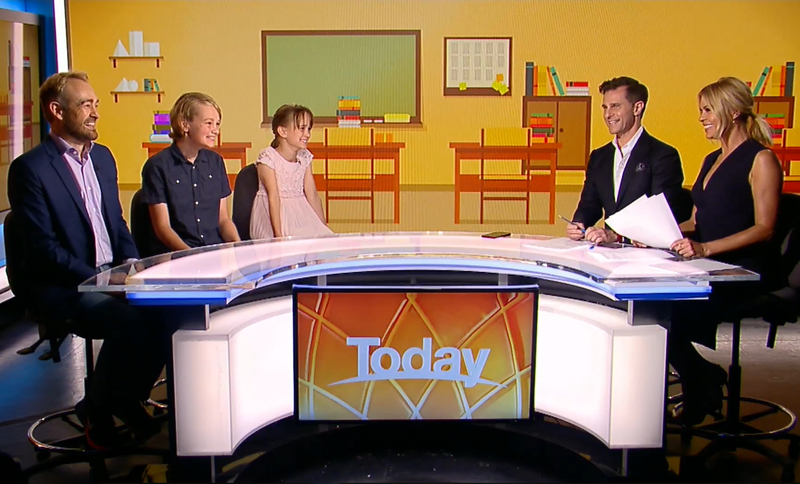 Sort My Money founder and personal budgeting specialist David Rankin and two of his children, Lucas and Layla, caught up with Channel 9 Today Extra’s David Campbell and Sonia Kruger to discuss how to get kids into great financial habits for life. SONIA KRUGER: 66 per cent of Aussie parents are worried their kids don’t understand the value of money, and according to experts the rise of online banking and credit cards is to blame. DAVID RANKIN: On the same day every week, the same amount, and model that behaviour to your kids, and park the plastic as well – park the debit cards, park the credit cards, and it actually shows your kids that you’re only spending money that you already have. SONIA KRUGER: Pocket money is also a great way to teach your children about financial responsibility – so, Layla, how does the pocket-money system work at your house? LAYLA: I do jobs – like feeding my bunny, Albert. I make my bed, tidy my room and help make food. SONIA KRUGER: What sort of pocket money do your mum and dad give you – how much do you get? LAYLA: I get about $10 a week. DAVID CAMPBELL: Lucas, what do you have to do for your pocket money? LUCAS: I kind of do the same as Layla – help around the house, help with cooking the food, do the bins – all of that. DAVID RANKIN: He’s the bin man! SONIA KRUGER: I can give you twenty! DAVID CAMPBELL: So, David, it’s important to teach our kids chores like these, and I am starting to do that with my eldest, too. He has to do the recycling, he has to make his bed every day, he has to unpack the dishwasher. Some parents don’t want to do that – it’s just easier to do it yourself if you’re time poor. DAVID RANKIN: Yes, but it’s short-term pain, long-term gain, though. If you’re willing to take that short-term pain, and to get your kids doing the jobs, then it will pay dividends in the future. SONIA KRUGER: So, it’s also important to teach them about household bills, like electricity. DAVID RANKIN: Yeah, and also supermarket shopping – that’s a big-ticket item for a lot of families. I’m a big believer in getting your kids involved. It starts, for me, with a whiteboard in the kitchen. Everybody in the family, including the kids, including Layla, has to fill it in. If she eats the last bit of cereals in the house, she’s got to add it to the board. So then you’ve got yourself a read-made shopping list. SONIA KRUGER: Wow, dad’s a barrel of laughs, isn’t he! DAVID CAMPBELL: Layla, blink three times if you’re trapped! . . . Lucas, you got a mobile phone and that teaches you the value of things. What happened there? LUCAS: Yeah, I did. I ended up getting together all of my pocket money, my birthday and Christmas savings, and eventually I saved up enough money to get myself my very own mobile phone, so I was pretty excited. SONIA KRUGER: David, how much control should parents have over the way their children spend their pocket money? DAVID RANKIN: Well, it’s counter-intuitive – cos I think they should have the control. I think we’ve got to respect the fact that it’s their money, they’re doing the saving and we’ve got to allow them the freedom, if you like, to make mistakes as well. Cos the mistakes they make now, while they’re under your roof – the lessons learned from those mistakes – are gonna be a lot less costly than lessons they learn in the future. DAVID CAMPBELL: Layla, what do you wanna spend your pocket money on?